Yes, Virginia, there are still travel bargains to be had. 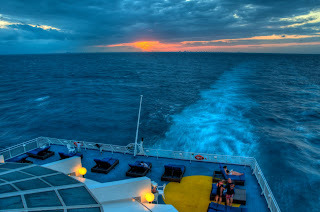 One of them sails out of the Port of Palm Beach regularly – the Bahamas Celebration by the Celebration Cruise Line. A two-night cruise for $159 is a bargain any way you look at it. When I sailed in the fall, you could add two nights at a four-star resort on Grand Bahama Island for only $130 more. Are you kidding me? Last time I checked, a nice hotel in Orlando can cost $289 for ONE night, and here you are getting four nights, lots of food, entertainment, real sea breezes, absolutely pristine white beaches and pampering galore. Add to the above, this is a medium-sized ship so you aren’t lost among 3 or 4,000 of your closest friends (enemies) waiting to go ashore. The cruises depart every other day, and offer you the opportunity to get away on short notice for the perfect pick-me-up. Check out some photos here. Great service - The ship’s crew is very attentive and mirrors the “my pleasure” attitude made famous by the Ritz-Carlton chain. 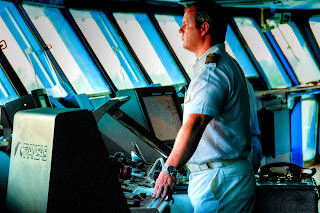 In speaking to the captain, Peter Fielding, he complimented the “can-do” attitude of all the 350 crew members, many of whom have been with the ship for years now. Full service – Being a smaller ship doesn’t mean limited services. The ship has a casino, multiple pools, library, multiple lounges, nightclub, four restaurants, spa, fitness room, and restaurants galore. Dining choices – With four restaurants, it’s hard not to find something you like. Meals at The Crystal Dining Room, Rio’s and Trattoria Di Gerry are all included in your package and serve a wide variety of tasty, appealing meals. 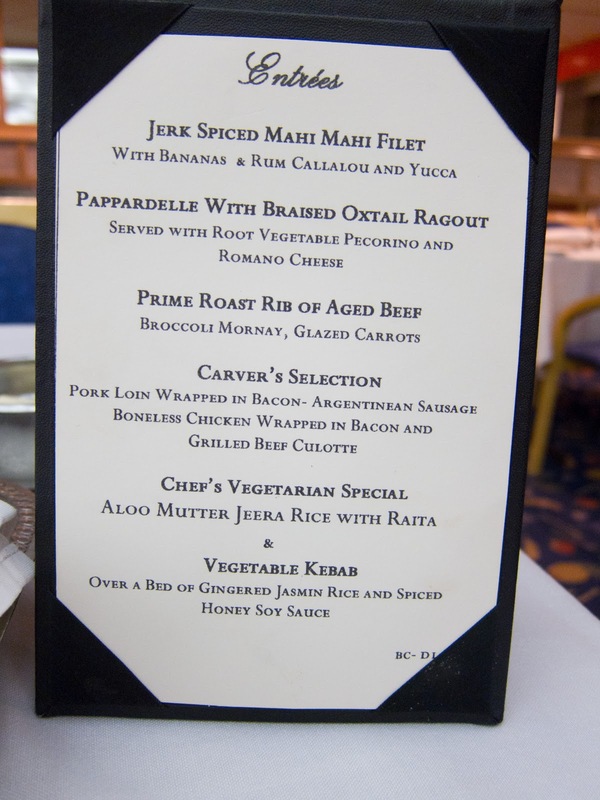 Expect a variety of meat, seafood, pasta and Caribbean recipes from which to choose. Dinner is a five-course, sit down meal, so relax and savor the culinary experience. The Cove Restaurant is designated the “more intimate” dining area and an additional $25/person charge is added here if you opt for a special evening meal. Adult pleasures – The Wynmore Casino is open until 3 am while at sea and a variety of card games and slots are offered in this cozy area on Deck 4. 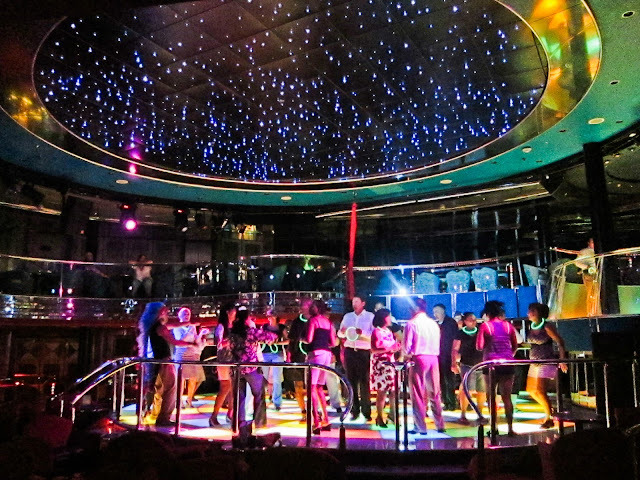 The View offers a variety of great entertainment and then dancing til you drop with a DJ pumping out the latest hits. Pub 437 offers low-key live music, a British Pub atmosphere and is a great place to chill if you like your music on the quieter side. Feeling fit – or the need to be? Before or after swimming in the pools, try a workout at Mussel Beach, the on-board gym where you can pedal, pump or run off that last meal. Afterwards, reward yourself with a massage or other full-service spa service in the Fountain of Youth Spa and Salon. Plenty to do for the kids – The ship has three separate daily schedules of activities for children. Junior Cruisers (ages 3-9) get together in the Island Coconut Club while their older counterparts (ages 10 to 13) have the Club Wave for their activities. Teenagers (14 to 17) get their own area in the Open Water Club. They all seem to enjoy the 180’ water slide on the stern of the ship. A selection of shore excursions – In addition to the option of spending the day at the Our Lucaya Beach Resort, you also could try glass bottom boat tours, snorkeling, swimming with the dolphins, a city tour or what I’ll be trying next, the “Ultimate Eco-Tour on Horseback.” There you’ll ride through the endangered pine forest, emerging onto the beach with an opportunity to ride out in the waves on your stead. For only $159, most people are probably scratching their heads going “What’s the catch?” So here goes, the whole scoop and what’s not included. Drinks – Just like virtually every cruise ship, drinks are extra. If you thought otherwise, you probably haven’t been cruising before. Drinks are reasonably priced however. A glass of Kendall Jackson Reisling sells for $5.75 plus 15% gratuity – less than most restaurants here in Cleveland. Taxes – Your helpful government needs to eat also, so they tack on $55.95 in taxes and fees to each ticket. Tips – In addition to your ticket, you’ll be charged a flat rate fee that goes to cover tips for all the ships staff. At $12 per night, expect an additional $24 to be added to your invoice for the two-night cruise. Again, typical for most cruises, and I actually like not having to always have singles available. Top-Name Talent – You won’t find Radiohead or Taylor Swift headlining the entertainment. What you do get are a superb selection of singers, comedians and former Cirque de Soleil performers. Very entertaining and perfect for a smaller, close-to-the-talent venue. A brand-new boat – The Bahamas Celebration was originally built in 1981 when it sailed between Norway and Germany. It was completely renovated in 1995 when 100’ was added to its length. The décor is modern but not posh. New carpeting and flat screen TV’s accentuate the cabins, which start at 140 s.f. and increase in size to 270 s.f. in the deluxe suites. 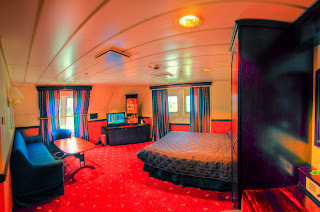 Most staterooms I viewed were very clean and more than comfortable for a journey of just two nights. After all, who plans to spend their time in the stateroom. You come to the Caribbean for the fresh air and the sunshine. If you are really concerned about being cramped, spring for a suite – it’s only $120 or so more than a standard cabin. The deluxe suites are very spacious and should please all but the most hard-core cruise snobs. Eric Martinez and Amber Wood, both active travelers in the airline industry, commented that they loved the stellar service aboard the ship. When pressed for shortcomings, they mentioned that the ship was obviously older than many, but they rated the overall value as better than most other cruises they had ever done. Somehow the Celebration Cruise Line has done what most frugal travelers have only dreamed of…combining good food, good staff and a great cruise to a desirable destination for a most modest fee. Check out their video on YouTube or check their website. You can view some of my photos from the trip here. Prices change with seasons and availability, so be sure to verify pricing with the cruise line or your travel agent.